This morning as I was putting my "I have to see people today" face on, I got one of those A-ha! moments. Nay's Get Beautiful Morning Routine! I have always been a minimalist when it comes to make up. 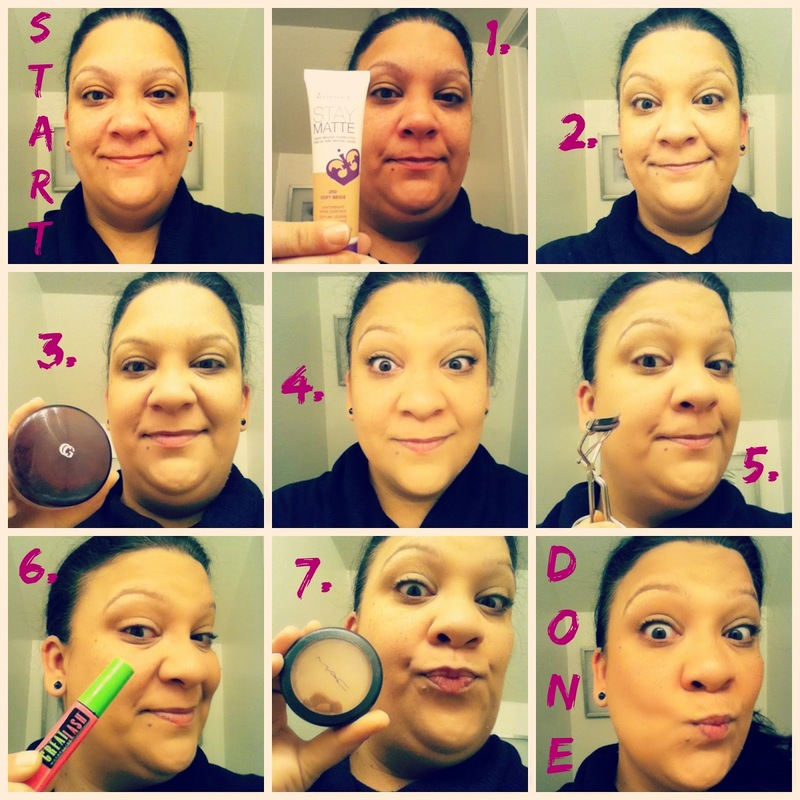 It took me a long time - and many mishaps from high school through my twenties - to get an easy and quick morning make up routine. Squeeze a little bigger than a pea-size amount of foundation. I used "Rimmel London Stay Matte Liquid Mousse Foundation" today because I was so thrilled to use it after I got it in the mail last night. Make sure to have the foundation blend into your skin to avoid "the mask" look. Next I use a transluscent loose powder in my skin tone shade. This one is by CoverGirl and I get it at CVS. Cheap and does the job. Curl them eyelashes yo! I never thought this made a difference, but it does! Curl them a few times and you're ready for the next step. Okay, this part...make sure you have a steady hand (and there hasn't been an earthquake in the last day or so - jeesh, Cali, calm down already!). Please ignore my pitiful blush remains...but next I lightly put on some blush/bronzer. Really, I have no idea which one it is since it's so old...but it works so hey! It's MAC, so you know it's old since I don't usually splurge like that anymore. Anyway! I put the blush on the apple of my cheeks. I notice if you do the fish face, it's easier to figure out where to apply. I usually slap on some chapstick or lipgloss in the car (if I remember). I'm really bad at the lipstick thing since I forget to reapply throughout the day. Do you have any pointers for me on my morning make-up routine? When I was doing Mary Kay, they taught me that if you have zero time, you can use your bronzer/blush as your eye shadow too. Who knew? Anyway my dear, you are gorgeous no matter what! Never heard the fish face tip! I must try it! 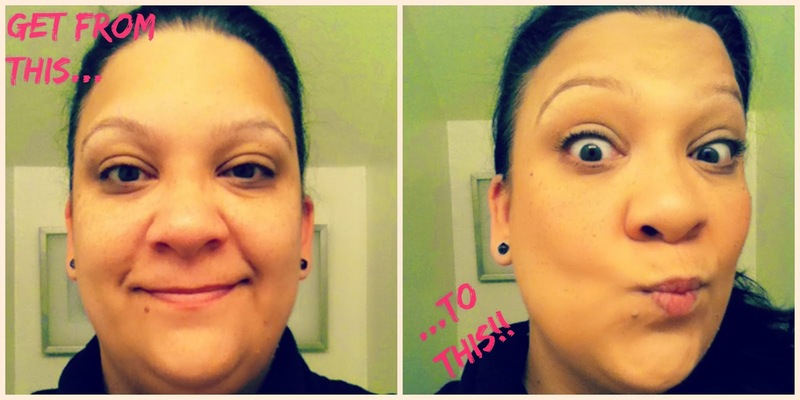 I need to find a better shade of foundation so I'm not an orange bahama mama! Okay, so I swear in number 5 you had a razor in your hand! Bwahahaha! Okay, sorry not funny. I've switched to E.L.F. cheap and I love it.. of course I'm sitting here with mascara on top of my eyes I'm sure cuz I'm wearing glasses today and didn't have contacts in. Ehh who the crap cares, I don't have to see people. You look beautimous as always! Loves! Very nice- I'm definitely a minimalist too. Most days I'm too lazy to even put on makeup, but we'll see how many more years (months? days?) I can get away with that... Watch out for those earthquakes, yo.